The weather cleared up at noon, and the sun shone out a little just as the battle began. The armies were within eight hundred yards of each other, the vedettes, before they were withdrawn, being so near as to be able to converse. At one moment I imagined that I saw Bonaparte, a considerable staff moving rapidly along the front of our line. 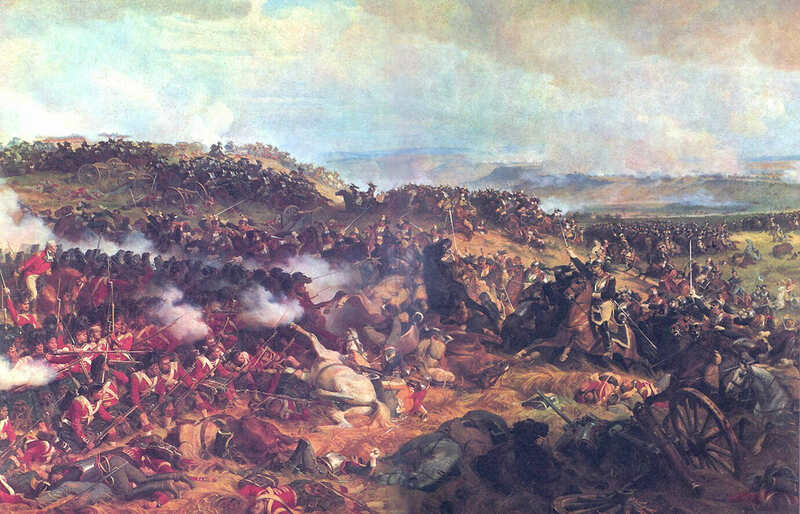 I was stationed with my regiment (about 300 strong) at the extreme of the left wing, and directed to act discretionally: each of the armies was drawn up on a gentle declivity, a small valley lying between them. 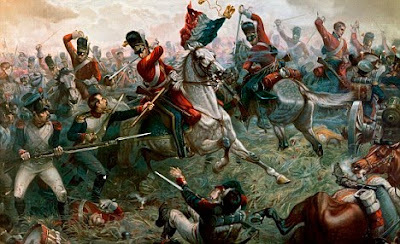 At one o’ clock, observing, as I thought, unsteadiness in a column of French infantry (50 by 20 – 1000 – or thereabouts), which were advancing with an irregular fire, I resolved to charge them. 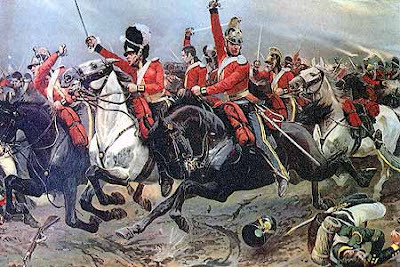 As we were descending in a gallop, we received from our own troops on the right a fire much more destructive than theirs, they having begun long before it could take effect, and slackening as we drew nearer: when we were within fifty paces of them, they turned, and much execution was done among them, as we were followed by some Belgians, who had remarked our success. We had no sooner passed through them, than we were attacked in our turn, before we could form, by about 300 Polish lancers, who had come down to their relief. The French artillery poured in among us a heavy fire of grape-shot, which, however, for one of our men killed three of their own: in the melee I was disabled almost instantly in both of my arms, and followed by a few of my men, who were presently cut down (no quarter being asked or given), I was carried on by my horse, till receiving a blow on my head from a sabre, I was thrown senseless on my face to the ground. Recovering. I raised myself a little to look round (being, I believe, at that time in a condition to get up and run away), when a lancer passing by, exclaimed, “Tu n’es pas mort, coquin!”, and struck his lance through my back; my head dropped, the blood gushed into my mouth, a difficulty of breathing came on, and I thought all was over. Not long afterwards (it was then impossible to measure time, but I must have fallen in less than ten minutes after the charge,) a tirailleur came up to plunder me, threatening to take my life. I told him that he might search me, directing him to a small side-pocket, in which he found three dollar, being all I had; he unloosed my stock and tore open my waistcoat, then leaving me in a very uneasy posture; and was no sooner gone, than another came up for the same purpose, but assuring him that I had been plundered, already he left me; when an officer, bringing on some troops (to which probably the tirailleurs belonged), and halting where I lay, stooped down and addressed me, saying, he feared I was badly wounded. I replied that I was, and expressed a wish to be removed into the rear: he said it was against the order to remove even their own men, but that if they gained the day, as they probably would (for he understood the Duke of Wellington was killed, and that six of our battalions had surrendered), every attention in his power should be shewn me. I complained of thirst, and he held bis brandy-bottle to my lips, directing one of his men to lay me straight on my side, and place a knapsack under my head: he then passed on into the action, and I shall never know to whose generosity I was indebted, as I conceive, for my life – of what rank he was I cannot say. he wore a blue great coat. By and by another tirailleur came, and knelt and fired over me, loading and firing many times, and conversing with great gaiety all the while; at last he ran off, saying, “Vous serez bien aise d’entendre que nous allons nous retirer; bon jour, mon ami”. While the battle continued in that part, several of the wounded men and dead bodies near me were hit with the balls which came very thick in that place. 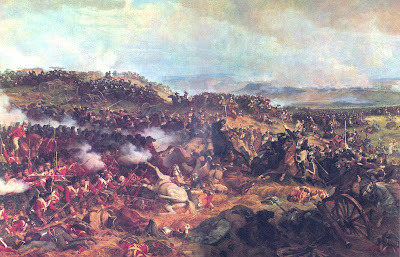 Towards evening, when the Prussians came, the continued roar of the cannon along their’s and the British line, growing louder and louder as they drew near, was the finest thing I ever heard. It was dusk, when two squadrons of Prussian cavalry, both of them two deep, passed over me in full trot, lifting me from the ground, and tumbling me about cruelly: the clatter of their approach, and the apprehensions it excited, may be easily conceived; had a gun come that way it would have done for me. The battle was then nearly over, or removed to a distance; the cries and groans the wounded all around me became every instant more and more audible, succeeding to the shouts, imprecations, outcries of “Vive I’empereur” the discharges of musquetry and cannon; now and then intervals of perfect silence, which were worse than the noise – I thought the night would never end. Much about this time, I found a soldier of the Royals lying across my legs, who had probably crawled thither in his agony; his weight, convulsive motions, his noises, and the air issuing through a wound in his side, distressed me greatly, the latter circumstance most of all, as the case was my own. It was not a dark night, and the Prussians were wandering about to plunder (and the scene in Ferdinand Count Fathom came into my mind, though no women, I believe, were there); several of them came and looked at me, and passed on; at length one stopped to examine me. I told him as well as I could (for I could say but little in German), that I was a British officer, and had been plundered already: he did not desist, however, and pulled me about roughly before he left me. About an hour before midnight, I saw a soldier in an English uniform coming towards me; he was, I suspect, on the same errand. He came and looked in my face; I spoke instantly, telling him who I was, and assuring him of a reward if he would remain by me. He said that he belonged to the 40th regiment, but had missed it, He released me from the dying man: being unarmed, he took up a sword from the ground, and stood over me, pacing backwards and forwards. At eight o’clock in the morning some English were seen at a distance; he ran to them, and a messenger was sent off to Hervey. A cart came for me. I was placed in it, and carried to a farmhouse, about a mile and a half distant, and laid in the bed from which poor Gordon (as I understood afterwards) had been just carried out: the jolting of the cart, and the difficulty of breathing, were very painful. I had received seven wounds; a surgeon slept in my room, and I was saved by continual bleeding, 120 ounces in two days, besides the great loss of blood on the field. The lances, from their length and weight, would have struck down my sword long before I lost it, if it had not been bound to my hand. What became of my horse I know not; it was the best I ever had. The man from the Royals was still breathing when I was removed in the morning, and was soon after taken to the hospital. 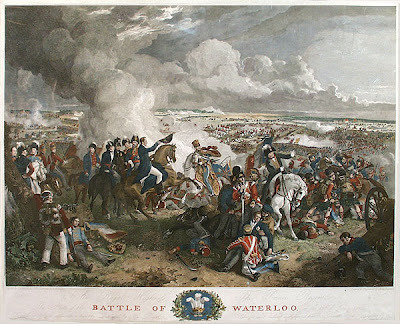 Sir Dennis Packe said, the greatest risk he ran the whole day wag in stopping his men, who were firing on me and my regiment when we began to charge. The French make a great clamour in action, the English only shout. Much confusion arose, and many mistakes, from similarity of dress. The Belgians, in particular, suffered greatly from their resemblance to the French, being still in the very same clothes they had served in under Bonaparte.